Another year has come and it's time to celebrate your birthday again! 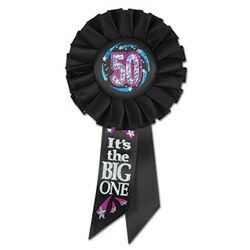 What better way to ring in your 50th birthday than with a 50 It's The Big One Rosette Ribbon. Make your 50th birthday party exciting and one for the books! The 50 It's The Big One Rosette Ribbon sets the party up for a night of laughter and fun! You're never too old for party games, especially old fart party games that will get your guests laughing! Don't forget to spice up the cake with funny gag candles!